Your tile flooring needs the care and love it deserves. Keeping it looking good will prolong its life, make it sparkle, and can improve your home’s value. Though tile doesn’t require too much maintenance, ensuring it’s clean will make a difference. Though you might have cleaned your tile floor in the past, you might not have used these tips and tricks to make sure it sparkles. This tutorial will tell you what you need, and what steps you should take to clean your tile floor properly. After all, when it comes to making your home look good, you should do as much as you can. Cleaning a tile floor doesn’t require too many tools, and the fewer you have, the better off you’ll be. To follow this tutorial, you will need the following. Broom/Tile Vacuum: You will need a broom or a tile vacuum to make sure you get all the extra dirt and grime off the floor. Water and Detergent: The water and the detergent should mix together. You don’t need to make it all sudsy, but make sure to mix together. Mop or Chamois Mop: Unless you want to spend your afternoon cleaning session on your hands and knees, you’ll need a mop or chamois mop. Baking Soda: Having some baking soda will come in handy when it’s time to clean the grout. Towel: A towel will come in handy when you need to soak up excess water. Bucket: Keeping bucket nearby will prevent you from having to use the sink. Nylon Brush: This will help you clean the grout. Lemon Juice: This will be used after you’ve mopped the floor and it has dried out. You should take the bucket, fill it with water, and add detergent. You won’t need to add too much detergent, and you should make sure you have it at a warm temperature. The detergent should be a mild detergent so that it doesn’t damage the tile when you mix the water with it. You can then set the bucket out of the way for sweeping up the extra dirt and debris on your tile floor. Depending on whether you have a broom or a tile vacuum, you want to make sure you get the larger bits of debris off the floor before you clean the tile. Otherwise, you’ll be left with a huge mess, and chances are, you’ll have to clean the tile again. You should make sure to get the corners where dirt can build up. You should also use the broom or vacuum to clean out the grout. Dirt and hair can get stuck in the grout, so making sure those areas are clean will ensure your tile floor is as clean as can be. You will want to dip the mop into the bucket before you use the water. You can dip in the bucket, squeeze out the excess water, and start mopping. You want to use circular motions to clean the top of the tiles. You should start from the back and work your way to the front. You shouldn’t step in the areas where you’ve mopped, otherwise you’ll have to mop it again. Make sure to change out the water frequently to ensure you’re not using dirty water to mop your tile. The lemon juice is the next step. Once the tile is dry, you will want to use a fresh, clean bucket of water. You should rinse your floor with the water, and then mix the lemon juice with it. A lint-free cloth should be used on the floor, and you can use your foot to move the cloth around. You can use circular patterns to make sure the floor is cleaned. 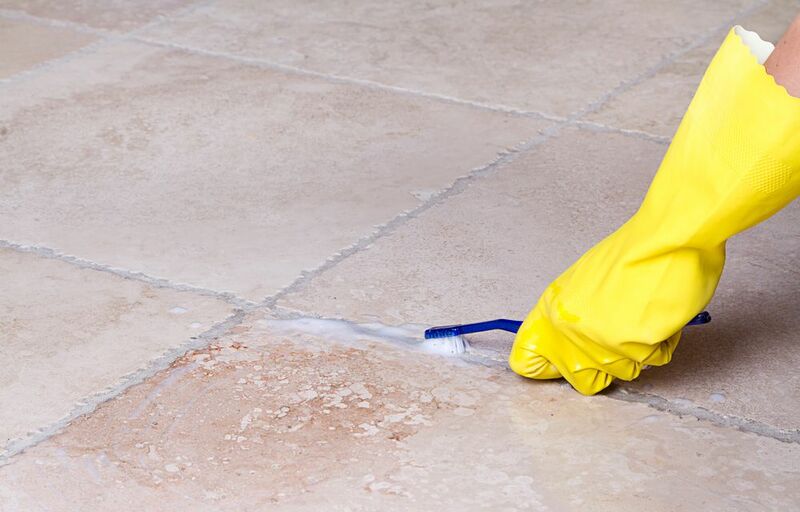 This will prevent any soapy residue from making your tile look dull. The last step you want to do is clean the grout. You should use the baking soda and mix it with water. You can rub it in the grout, let it sit overnight, and scrub it with a nylon brush. A metal brush will damage the grout, leading to expensive repairs. Cleaning a tile floor isn’t always fun, but it is easy to do. As long as you have the right ingredients, and don’t use any harsh chemicals, you’ll be fine. Your tile floor deserves to look its best, and this tutorial should help you accomplish that. We hope you enjoyed the article, and we would love to hear your comments. Feel free to spread this tutorial with your friends, and see who can make their tile floor shine and sparkle.